Having imploded at the Paris Marathon last month, I almost immediately decided that I was not going to wait for a whole year for another crack at beating my marathon PB. Although I knew I wasn’t fit, I was disappointed with my time in Paris. So I searched for a marathon I could enter to have another go. I came across the Milton Keynes Marathon held on the first bank holiday Monday in May. My Dad lives in Milton Keynes and it was soon enough to satisfy my need and far enough off to allow me to recover from Paris. I entered. We travelled up on the Sunday and stayed in the Premier Inn. My Dad’s house is too small to accommodate us all so it’s easier to stay in a hotel. Victoria was happy because it meant she could go shopping in Milton Keynes whilst I ran the marathon. She does like Midsummer Place. Elsa and Ellis were happy because it meant they could go and see the frog clock in the shopping centre. Unfortunately it was to be another frustrating marathon, but another where I could identify possible issues. 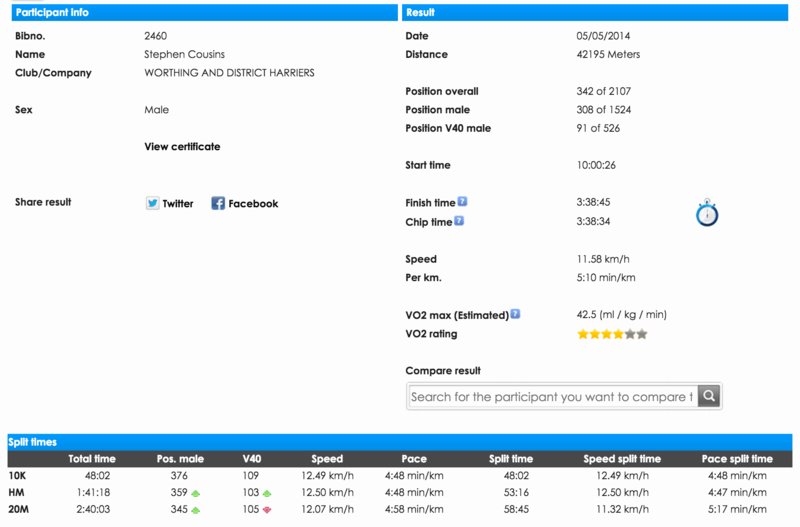 In terms of training, looking back at my Garmin stats although I did plenty of running, I only did one long run between Paris and Milton Keynes and that was a very slow 19 mile meander. Perhaps that was a factor, perhaps not. The main failing this time was nutrition. I simply didn’t have an effective strategy. I wasn’t diligent enough about taking on water on such a warm day and I wasn’t diligent enough about taking my GlucoTabs regularly. I decided to try and run at 7:40 pace, which would hopefully get me in at around 3 hours 25 minutes. I wanted to keep a steady pace all the way round, bearing in mind the mistake I made in Paris just a month earlier. Unfortunately I didn’t realise I wasn’t fit enough to run at that pace either! I should have stuck to 7:50s or even 8 minute miles. The race starts outside the MK Dons football stadium and finishes inside it. The route is a mixture of tarmac roads and red hardpack pathways. It’s very pretty in many places, when running past lakes and through parks. But it’s also rather dull in places, when you run through housing estates and on main roads. I ran fairly well for the first half of the race and actually felt quite strong. I couldn’t sustain it though and started to slow at around 15 miles. I kept running though, and in fact, apart from a quick wee break, I didn’t stop for the whole 26.2 miles. But I did slow down significantly and once again by 20 miles I could sense I wasn’t going to make my PB. I hit 20 miles bang on time in 2:38 giving me 50 minutes to complete the final 10k. But as anyone who has run a marathon will know, those last 6 miles are unlike any other 6 miles you will ever run. I pushed on but I just couldn’t keep to any decent pace. Then the cramp started to kick in. I was dehydrated and tired and that’s when cramp starts to take hold. Running in to MK Dons stadium at the end of the marathon is supposed to be your glory moment. You race round the track triumphant as your family and thousands of supports cheer you on. In reality, it wasn’t like that at all for me. I limped in to the stadium looking for all the world like I was about to die! I felt awful. I crossed the line in 3 hours 38 minutes. A minute slower than my Paris marathon time. Although I was disappointed again not to beat my PB and doubly disappointed that I didn’t even beat my Paris time, I was actually more satisfied with the run in terms of consistency. I ran all the way and that gave me some comfort. There are a number of issues I can point to which contributed to this result. Carrying my GoPro camera was not one however. I had decided to leave it and concentrate on running rather than filming. As it was it doesn’t seem to have affected me either way. The Milton Keynes marathon was hotter than Paris. I think the heat contributed to my dehydration and fatigue. Obviously I didn’t drink enough and I hadn’t put in the right kind of training in the previous weeks. I threw up when we got back to my Dad’s house so that definitely tells me my nutrition was all messed up. I am slowly learning the art of marathon running. I have now run 4 marathons. I will get it right again one day. As far as the Milton Keynes marathon goes, I think it’s a tough course. There are no big hills, but nevertheless it’s quite undulating which saps the legs. The course is not particularly scenic either. As I mentioned, there are some nice sections of park and lakes, but in general it feels like main roads and housing estates most of the ways round. I may do it again one day, but I’m not clamouring to get back next year.